Illinois: Solidarity Day 2 Celebrated | Fight Back! 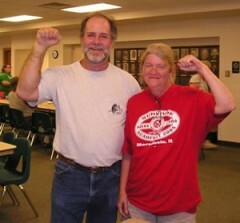 Canton, IL - About 100 trade unionists and others gathered here, July 8, for Solidarity Day 2. This second annual picnic and program celebrating the solidarity of working people brought together labor activists from Illinois, Michigan, Minnesota and Missouri. Rob Wilson, a rank-and-file leader of UAW members at Caterpillar told the crowd that the corporate elite that run this country do not care about anyone or anything except their bottom line. Larry Solomon, retired president of Decatur UAW Local 751 and a legendary labor leader of the mid-1990s battle with Caterpillar, gave the Solidarity Day address, in which he called on workers to come together to transform the labor movement and the country as a whole. 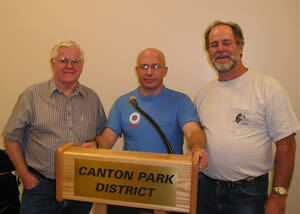 Other speakers included Tom Seymour, retired president of UAW Local 858 and Leroy McKnight, a General Motors retiree. Rank-and-file UAW members at Caterpillar are a positive example for the rest of the labor movement. In April, UAW Local 974, located in East Peoria, Illinois, held an election for delegates to the United Auto Workers International Constitutional Convention. In a stunning upset for the incumbent caucus, the Members for Change! group, led by Rob Wilson, won a majority of five delegate positions out of eight.